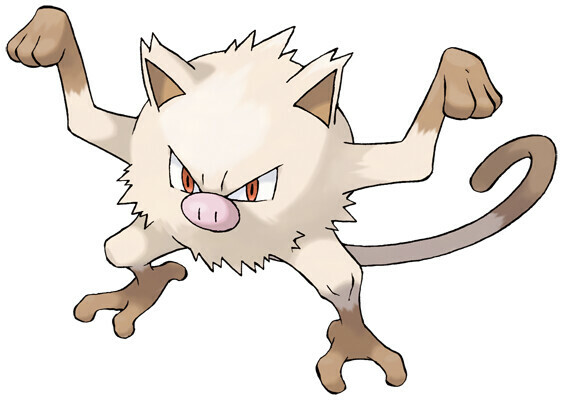 Mankey is a Fighting type Pokémon introduced in Generation 1. It is known as the Pig Monkey Pokémon . The effectiveness of each type on Mankey. In Generation 3, Mankey does not have the Anger Point ability. In Generation 1, Mankey has a base Special stat of 35. In Generations 1-4, Mankey has a base experience yield of 74. Extremely quick to anger. It could be docile one moment then thrashing away the next instant. An agile POKéMON that lives in trees. It angers easily and will not hesitate to attack anything. It is extremely ill-tempered. Groups of them will attack any handy target for no reason. It's unsafe to approach if it gets violently enraged for no reason and can't distinguish friends from foes. It lives in groups in the treetops. If it loses sight of its group, it becomes infuriated by its loneliness. When MANKEY starts shaking and its nasal breathing turns rough, it’s a sure sign that it is becoming angry. However, because it goes into a towering rage almost instantly, it is impossible for anyone to flee its wrath. Light and agile on its feet, and ferocious in temperament. When angered, it flies into an uncontrollable frenzy. Extremely quick to anger. It could be docile one moment, then thrashing away the next instant. When it starts shaking and its nasal breathing turns rough, it’s a sure sign of anger. However, since this happens instantly, there is no time to flee. It lives in treetop colonies. If one becomes enraged, the whole colony rampages for no reason. It’s unsafe to approach if it gets violently enraged for no reason and can’t distinguish friends from foes. It can spontaneously become enraged. Everyone near it clears out as it rampages, and the resulting loneliness makes it angrier still. Its raging tires it out and causes it to fall asleep, but the anger resonating in its dreams causes it to wake up—which infuriates it all over again. The smallest of things could cause it to lose its temper. Because it doesn’t hold in its stress, this Pokémon can live a long time. If one gets angry, all the others around it will get angry, so silence is a rare visitor in a troop of Mankey. Mankey learns the following moves in Pokémon Let's Go Pikachu & Let's Go Eevee at the levels specified. Mankey learns the following moves in Pokémon Ultra Sun & Ultra Moon at the levels specified. Mankey learns the following moves via breeding in Pokémon Ultra Sun & Ultra Moon. Details and compatible parents can be found on the Mankey egg moves page. Mankey can only learn these moves in previous generations. It must be taught the moves in the appropriate game and then transferred to Pokémon Ultra Sun & Ultra Moon. Who is the Counterpart to Mankey in HGSS?